Stop faster with SwissStop's high performance brake pads. Advanced materials and an incredibly detailed production process ensure the powerful braking performance and superior modulation relied on by pro riders. The FlashPro replacement pad fits Shimano 9/10, SRAM and TRP holders. Available in three rubber compounds. This version features the blue BXP high performance compound, which takes over for SwissStop's green pads, offering even better modulation and superior braking power in wet conditions, optimized for aluminum rims. Sold in sets of four pads (enough to retrofit a front and rear brake). Feel soft but work great in stopping. no grinding from grime build up. I'm new to this brand and specifically these pads. They feel softer than other pads, even the black Swiss stop that were so impressive I decided to try these (on sale) . I've run salmon colored pads for years which were harder and felt harder. They both are great in that they don't collect dirt and road debris which can wear and score aluminium rims. I believe these Swiss stop pads feel softer though because they are so great at modulating the stop so they neither grab nor drag significantly. It may take some getting used to but so far great product. I bought a new set of Dura Ace 9100 calipers and replaced the stock pads before even mounting the calipers. When it comes to safety I opt to spend a few extra dollars every time. First time purchase, like the feel better than Shimano pads, a little softer. They work well in the rain, cant speak to how well they wear yet. Brakes better than Shimano Dura Ace. Less abrasive for wheels. These pads have great stopping power, even in the rain. Threw these on my cross bike after killing my last set in a season. They went on pretty easily, though I did have to readjust everything since my others were worn so badly, but that isn't any fault of these pads. Pretty good stopping power on almost all conditions. They held up well to mud and ice so far. Long term we'll see how they do. Happy so far with them. Look no further, best brake pads out there for aluminum rims. Stops well in the wet or dry. Feel is good and they don't seem to fade with heat on descents. I like these pads. These are the only brake pads I use now. Probably the best for non-disc road bikes. I use these to slow& stop my bike, wet dry. When I find something that works that's what I use. Last a season, ( 6000mi.) lots of stopping power when new, less as they age,but better than others I've used. 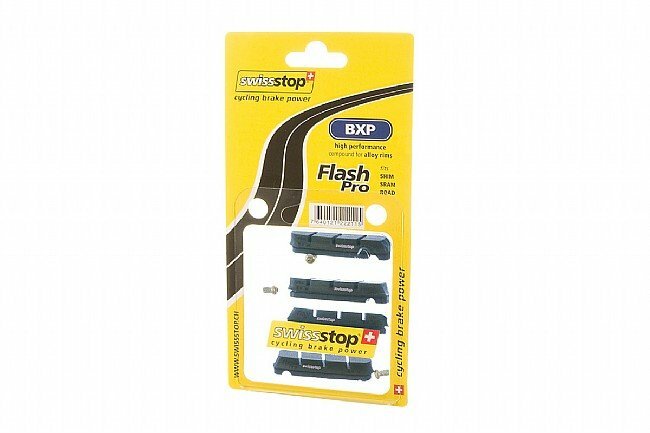 The SwissStop Flashpro Blue BXP Brake Pads were purchased specifically for a 100 mile riding event forecasted to be rainy. The meteorologists actually got it right. Though it wasn't a down poor, the roads were wet most of the ride. The SwissStop Blue pads came through and performed as advertised. I found breaking in the wet weather not to be an issue as the SwissStop Blue pads did significantly out perform my old break pads. Breaking was so good that during down-hills I didn't worry about not being able to stop (in time). This allowed me to concentrate on my riding. -and that's a good thing! Much improved stopping power and modulation over the typical OEM Shimano pad. Rode a bike with these installed in Ultegra 6800 calipers yesterday and was impressed once again with how well they work. My only complaint would be that the included setscrews are a bit cheap compared to Shimano. Well worth the money. I have used these brakes in racing and training. Great value. I have been using these for awhile, wear is goid and they stop great! The best brake pads for aluminum rims. The BXP pads are great in both the wet and dry and do not wear out your rims. My experience is that these Blue BXP pads give better modulation and better WET stopping power. The Original Black pads have better DRY stopping power and last longer but have a little less modulation. I use both kinds with SRAM brakes (Force 22, Red Aero) and TRP linear brakes (CX 8.4). I tend to use the Blue BXP on my road bikes in late fall and early spring when occasional showers or wet roads are common. I also use the Blue BXP on a rail trail cyclocross bike in wet conditions (Kool Stop Salmon pads for dry conditions). I've been running Blue BXP pads in all conditions for the past 6 weeks and have been impressed by their stopping action and wear resistance. Even on slick, dirty roads, the braking is smooth and predictable. They also appear to be lasting longer than my cheaper go-to all condition pad, so the extra cost is probably worth it.